I so badly wanted to do a ‘week of’ series this week of all Super Bowl themed food, since the Super Bowl is this Sunday. In fact I even had all the recipes made and the photos taken (who knew I could be organized and prepared! LOL! ), but I don’t really have time edit those photos, type the recipes, and write the blog posts (my sister and friend are getting married back to back and I am deep in bridal shower and wedding cake plans). AND I didn’t want to promise a week of Super Bowl recipes the week of Super Bowl and not be able to full fill my promise of blogging about them. So I will share 1 or 2 of these recipes the next few days as well as host another giveaway (fair trade I must say)! Anyway today’s recipe and blog article is one that I wrote for Food on the Table on tips to throw a Super Bowl party on a budget with an accompanying budget-friendly chili recipe (that I have shared on the blog before). I had so much fun writing this article and I was super excited when a newspaper reporter from Indiana called and wanted to interview me because of this article! I had the interview yesterday and despite my nervousness I think it went well! I will have to post a link to that article as soon as the interview is published. I hope you enjoy these Super Bowl party tips and I am curious what are your Super Bowl plans and traditions? Even if you are not a football fanatic the other 364 days of the year, one can’t help but join in the fun and festivities when the Super Bowl rolls around! Planning and throwing a Super Bowl party can be time and labor extensive, not to mention expensive. But it doesn’t have to be any of those things if you plan accordingly and utilize these smart Super Bowl Party Tips. • Show some sprit. Don’t worry if you don’t have any football themed decorations, simply decorate in your team’s colors. • Hydrate the team. Even though football is traditionally a beer drinking sport, have plenty of water and soda on hand for those designated drivers. • The first quarter. Premade fruit and veggie trays can be pricy. Making your own is inexpensive and can be put together in about 15 minutes. Baby carrots, celery sticks, grape tomatoes, cucumber slices and broccoli all make great choices for a vegetable tray. For a tasty fruit platter try grapes, strawberries, cantaloupe, honeydew melon and pineapple. • Keep the food hot when the game gets going. Crockpots are great tools for parties because they will keep food hot without supervision. Queso, cocktail meatballs, soup, chili, or even spinach artichoke dip can all be made in the crockpot and are great game day foods. • Half time. 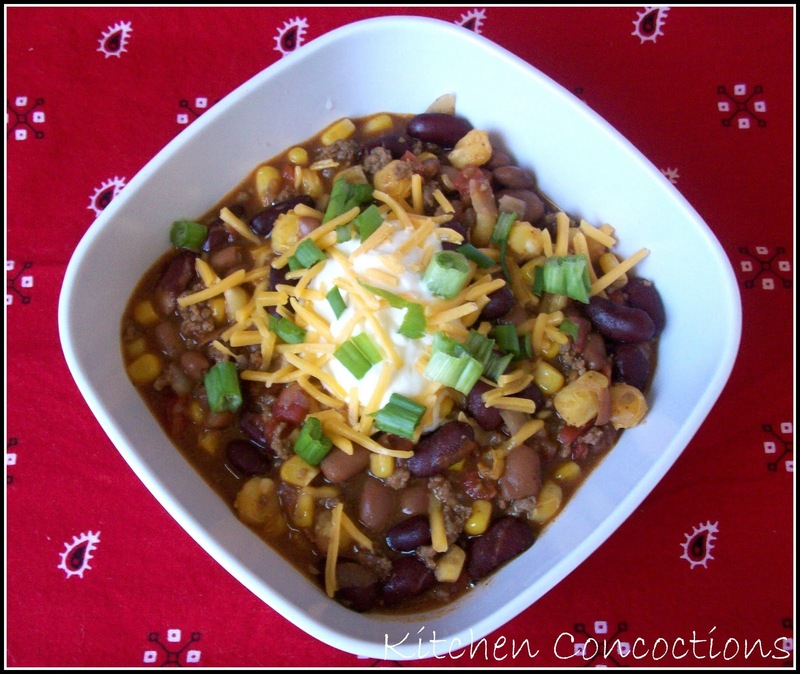 Chili is a crowd pleasing football favorite. It is easily made in a crockpot and uses budget friendly ingredients such as beans and canned tomatoes. A ‘chili bar’ is a fun way to serve up your chili to guests. Set up an accessible table with all of your favorite chili toppings such as cheese, chips, cornbread, chives, sour cream, and crackers; and allow your guests to serve themselves. • Football is a team sport. Don’t be afraid to ask your guests to contribute to the party by bringing additional snacks, drinks or chili toppings. • The fourth quarter. Brownies or bar cookies are the perfect dessert to serve at parties. Most recipes for brownies can be mixed in one bowl and then cooked and served from one large pan, this makes preparation, clean up and serving a breeze. 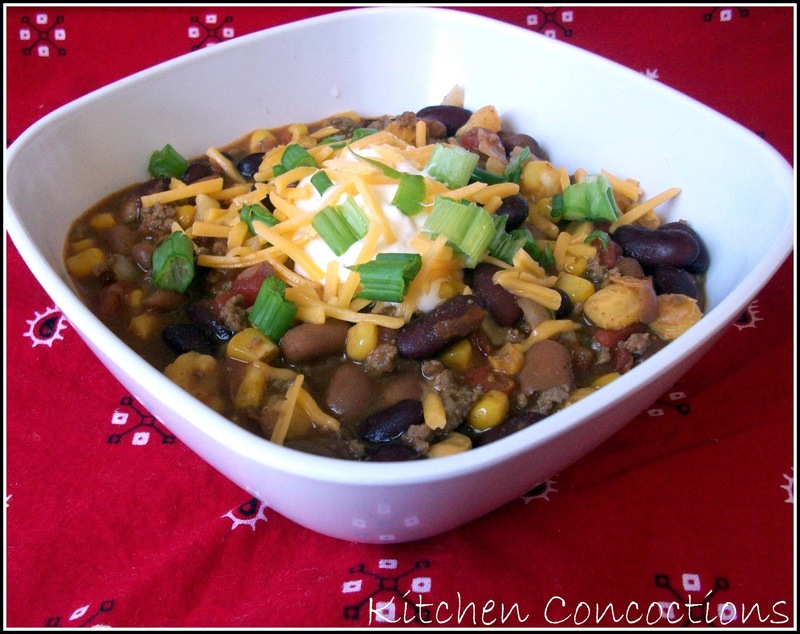 Chili not only makes great game day food, it is perfect for dinner any night of the week! Heat a large skillet over medium-high heat. Add ground beef and cook until brown and cooked through. Drain meat and return to skillet. Add diced onion, beef broth and 1 tablespoon of taco seasoning. Let ground beef and onion cook in taco seasoning/broth for 10 minutes. Meanwhile, add the corn, hominy, beans, tomatoes, ranch seasoning, chili powder, and 1 tablespoon of taco seasoning to crockpot. Once onion/beef mixture is done cooking, stir it into the crockpot with other the ingredients. Cook chili on high for 4 hours or on low for 6 hours. Serve topped with toppings of your choice. Chef Notes: This recipe can be prepared on the stove top if desired. Once the beef/onion mixture has cooked for 10 minutes stir in remaining ingredients and let cook for 20 minutes longer. Leftovers freeze well in plastic storage containers. « “Oatmeal Week” (and Month) is over… at least till next year! I'm not into the football part of the superbowl, but I do love the food part!! This chili sounds great – and congrats on the interview! Beautiful pictures of your chili and the tips…loved them. And sometimes life is to busy to promise a whole week of food. I kind of felt that way with my 12 Days of Christmas Cookies but once I started it wasn't like I could stop! Haha!